“To be or not to be”; LinkedIn is the question. While the bard himself may be turning in his grave with our flagrant misuse of one of his most respected quotes, it was the catalyst for the question ‘should universities be on LinkedIn?’ Or more specifically, do they need to up their game and realize its full potential. When we think about the core function of LinkedIn, we’re probably most likely to label it as a professional networking site that connects users with employers and employees with co-workers. It might not seem like the perfect habitat for universities but since last year’s launch of LinkedIn’s University Pages, the site has given a home to thousands of schools looking to showcase their brand, recruit students and connect with alumni. Of the professional networking site’s 300 million members, over 30 million of these are students and recent graduates. These 30 million students and recent graduates are among LinkedIn’s fastest growing audience. In today’s economic climate, it’s easy to fathom why universities worldwide are eager to link their programmes with industry and to prove to prospective students that attending their school does lead to postgraduate success. University Pages give universities the opportunity to display information on where alumni work, what they studied and what skills they have. With this information in mind, ask yourself firstly is your university on LinkedIn and secondly to what degree is your university using LinkedIn? Like any new social media venture, it takes time and more than a little fine-tuning to get it right. It’s not enough to simply click the sign up button and lie-in-wait for students and alumni to stumble onto your page. A successful university page requires a succinct strategy. 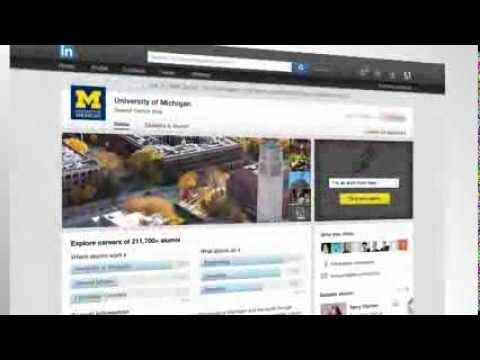 Any LinkedIn alumni member who lists your university on their profile is automatically listed as a follower of your page giving you access right from the start to potentially hundreds of thousands of professional LinkedIn users including potential students, parents and alumni (and donors). Information on these users can then be segmented into targeted marketing campaigns using filters such as industry, geographic location, company, title, seniority, education or language. University Pages also allow your institution to feature notable alumni and create groups which targets specific sectors of your audience. The universities who are most successful at using LinkedIn University Pages are engaging with their audience, posing questions, answering queries, encouraging current students to give their feedback and testimonials, engaging alumni to share their experiences and providing information that is of value to their audience. An active and interesting presence on social media is essential to success. Posting consistent updates that offer unique value to your audience are essential to ensuring the success of your LinkedIn University Page. The University Of Illinois at Urbana-champaign for example, uses their University Page to not only share news about their university but about the successes of their students and faculty members. Recently, they shared a story about two of their engineering students who have started their own toy company in a bid to help close the gender gap in science, technology, engineering and math. Groups that are of interest and benefit to prospective students and alumni are another great way to engage with your audience. The University Pages provides you with a dedicated place to advertise affiliate groups with the goal of boosting membership. LinkedIn doesn’t have to solely be used as a recruitment tool; many universities are also using it as a venue to promote discussion around research topics. Imperial College London are using their page to promote the ongoing research that their institution is doing in the fields of medicine, science and engineering. Whether you choose to promote alumni success stories, groundbreaking research or as a tool to engage and respond to students and alumni, LinkedIn gives you a readymade audience that you won’t find as readily on other social media sites. While facebook is busy decreasing your organic reach, LinkedIn is quietly becoming the staid and reliable choice for higher education. You know what they say, ‘With great power comes great responsibility’. Use your LinkedIn University Page wisely to weave your networking web and who knows what it could bring you; increased student numbers, greater student engagement and an unwavering connection to alumni.